Since this subject has no official name, the name Mushroom Pikmin is conjectural. Mushroom Pikmin (キノコピクミン?, less frequently known as Toadmin or Puffmin) is the name given to Pikmin that are under the control of a Puffstool. After being showered with spores, infected Pikmin will make a small aggressive sound and will change in appearance and behavior. This Pikmin status, along with the Puffstool, only appear in the first Pikmin game. The spores of the Puffstool cause affected Pikmin to morph into a strange form. Their eyes become pupil-less and dead-looking, their skin turns a dark shade of purple and an orange-brown mushroom cap grows on top of their stem. Their type's special physical characteristics, such as the noses, ears and gills are also gone. Check if the Mushroom Pikmin still die if they're close to the Onion. Document in detail how is it that sometimes, Mushroom Pikmin can return to normal after being whistled while battling normal Pikmin. Mushroom Pikmin each have the same stats as they did before they were infected, including attack power and resistance to hazards. They will follow Captain Olimar when he is in range and attack him while making an unusual sound that resembles menacing laughter. However, they do minimal damage and can be easily shaken off if the player rocks / . Once detached, a Pikmin will lay down for a while, sit down and slowly revert to its original form, after which it'll start obeying Olimar again. If Captain Olimar moves out of range, attacking Mushroom Pikmin stop following him and dance around the Puffstool. Mushroom Pikmin will not chase after normal Pikmin, but will become aggressive towards one if being attacked by it. Normal Pikmin do, however, chase after Mushroom Pikmin. As they can both be killed, this confrontation will simply decrease Olimar's overall Pikmin population. If any Pikmin are in this state at sunset, they will die like any other Pikmin species. In the New Play Control! version of the game, however, they will actually revert to their original form and become sprouts. Main articles: Rebel Mushroom Pikmin and Controlling Mushroom Pikmin. An interesting glitch has been known to occur if Pikmin are knocked to the ground at the same time they are hit with the Puffstool's spores. Upon standing up, the Pikmin will change into Mushroom Pikmin, but their skin will become a pale version of the color they were before they became Mushroom Pikmin, and their mushroom will glow as if they are idle. These Pikmin will turn upon the Puffstool, attacking it as if they are still under the player's control. 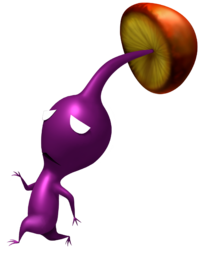 It is possible to get the glitched Mushroom Pikmin under the command of Olimar, but it requires a different technique and is more difficult to accomplish. If Pikmin are left idle by the Puffstool and called at the exact moment the creature inverts its cap (just before it blows its spores), the Pikmin may become glitched Mushroom Pikmin and rush to Olimar's side immediately after. Prerelease photo of Olimar and some Mushroom Pikmin. These Pikmin were made into stickers, buttons, and plastic figures attached to lanyards and suction cups to promote the sale of Pikmin. It normally takes a total of 200 hits from Mushroom Pikmin to take Captain Olimar down. When idle via the aforementioned glitch, the Pikmin are white with a bright red mushroom cap that doesn't glow like the other Pikmin. Video on Mushroom Pikmin against and with Olimar. This page was last edited on December 28, 2018, at 13:48.